Tourists visit the Maldives to experience diverse coral reefs, out-of-the-ordinary marine life, and beautiful palm-fringed beaches. When a business relies on natural assets like Six Senses Laamu does environmentally-responsible operations that conserve them are a must. What the resort does on land is just as important as what it does on and under water, and that is why MATATO (Maldives Association of Travel Agents and Tour Operators) has named Six Senses Laamu the Leading Eco-Resort at the Maldives Travel Awards 2018. Six Senses Hotels Resorts Spas operate with the philosophies of wellness and sustainability at their core. 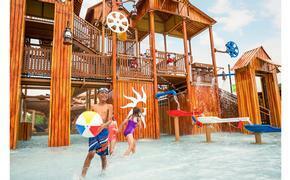 These values permeate through all areas of resort operations and into its local community outreach programs as well. An extensive list of corporate sustainability guidelines keeps properties on target to optimize energy efficiency, reduce water consumption, limit chemical usage, increase garden and food production, source locally, recycle materials, treat people equitably, give back to local communities and protect ecosystems. The map below summarizes Six Senses Laamu’s atoll-wide impacts in 2018. A 2018 Booking.com survey on travel trends found that 86 percent of global travelers are interested in offsetting the environmental impact of their stay. Six Senses Laamu seeks to raise awareness among tourists to be environmentally-conscious, both on holiday and when they return home. Being named Leading Eco-Resort 2018 has a lot to do with the resort’s guests who choose to stay at Six Senses for its commitment to sustainability. Water—Low-flow fixtures installed on taps and showers helped to reduce water consumption by 25 percent and 227,780 ft3 (6,450 m3) of grey water was recycled for landscaping. Waste—Six Senses has announced that the company will be plastic-free by 2022. By bottling our own desalinated water in reusable glass bottles, we avoided 226,600 single-use plastic bottles this year. Plastic-Free—55 reverse osmosis water filters were donated for all 21 schools and pre-schools in Laamu Atoll, as well as 30 households in L.Maamendhoo. 3,949 students and families now have access to safe, reliable drinking water and will avoid bringing more than 1,360,000 single-use plastic water bottles to school each year. Composting—Organic waste from landscaping is processed in a wood chipper machine and combined with food waste to be composted into organic soil for the gardens. The resort produced 22,597 pounds (10,250 kilograms) of compost in 2018. 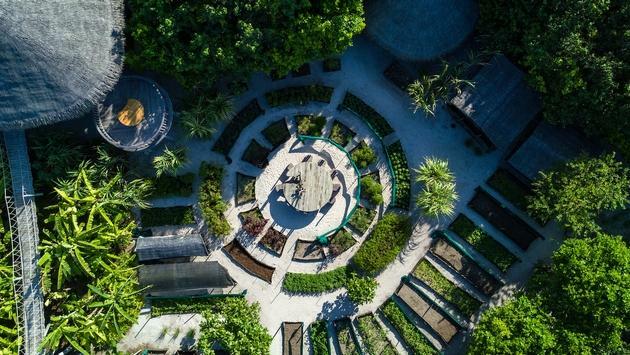 Leaf Garden—Six Senses Laamu produced 16,424 pounds of more than 30 different varieties of organic herbs, salad leaves, microgreens and sprouts for kitchens and bars, as well as more than 20 kinds of chillies and two varieties of mushrooms. Kukulhu Village—51 hens and four roosters now call Kukulhu Village (chicken farm) home. The flock produced a total of 1,750 eggs in their first eight months on the island – a drop in the bucket, but a high-quality, organic drop nonetheless. Sustainability Fund—Point five of one percent of total resort revenues, 50 percent of water sales, and 100 percent of soft toy sales are allocated towards local projects that benefit the surrounding environment or communities. Six Senses Laamu spent USD 204, 556 in 2018 on research and conservation, education and outreach, and community development in Laamu Atoll. Six Senses Laamu is the only resort in the Laamu Atoll, deep in the Indian Ocean, surrounded by a beautiful coral house reef. Most of the villas and facilities are built overwater however beach villas and on-land dining is an option. All villas offer a sense of privacy and seclusion, with an amazing view of the Ocean and Maldivian nature. Six Senses Laamu offers a wide range of dining options, with cuisines from around the world, an ice cream parlor, an overwater wine cellar, and a signature Chill bar. Many activities, excursions, and options are available for everyone to enjoy, both over water and underwater, in addition to the Six Senses Spa.